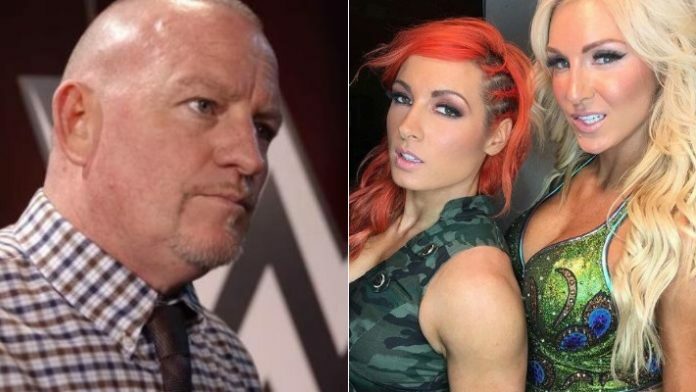 Road Dogg is asking fans to pick a side in the Becky Lynch vs Charlotte Flair rivalry. While he isn’t saying which side he wants them to pick, Road Dogg is adamant that fans choose one of the two to cheer for. Road Dogg made the comments while responding to a fan on Twitter. A fan commented on Road Dogg saying he’s not trying to turn fans against Becky when the Smackdown creative head responded. The fan then indicated he will be taking Becky Lynch’s side. Road Dogg responded positively as the fan had picked a side just as he suggested. So you’ve picked your side! Check! Talk then turned to Lynch’s attack from the crowd on Flair this week. The safety of the fan is paramount at events. Makes ya think ? don’t it?! If not, you’re not really seeing the bigger picture. The Flair vs Lynch rivalry has been contentious since before Summerslam. Lynch went on a winning streak and earned a title match against Carmella. Flair then returned from hiatus and was added to Lynch’s title opportunity by defeating Carmella in a non-title match. This also led to R-Truth and Carmella becoming a tag-team in the Mixed Match Challenge but that is another story entirely. Flair won the title at Summerslam by capitalizing on Lynch’s turned back. She has stated since that Lynch would have done the same thing. The two will meet one-on-one on Sunday for the Smackdown Women’s Championship.